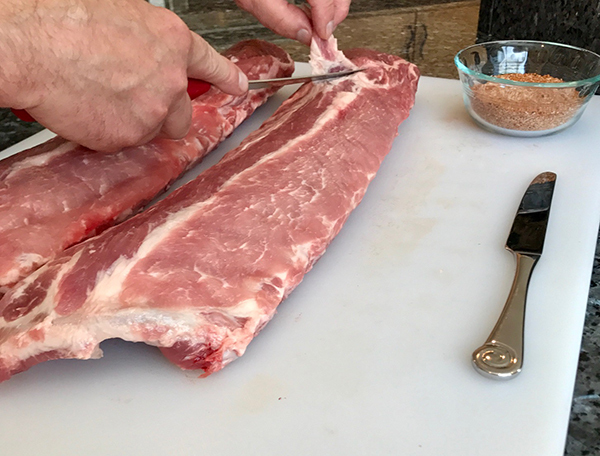 The key to making the best ribs ever starts with knowing what to look for when buying your ribs, and the proper way to prepare them for the grill or smoker. When shopping for ribs, choose the ones that have an even layer of meat across the ribs. You don’t want a large amount of meat on one end and little to no meat on the other end. 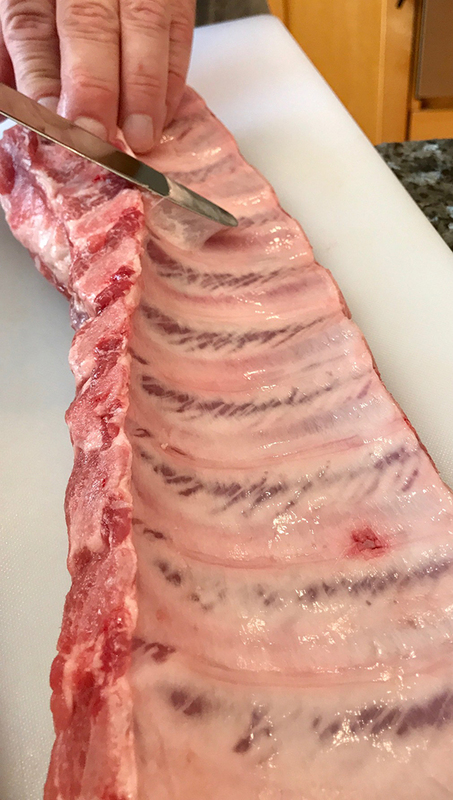 Shy away from slabs with exposed ribs, known as “shiners”, which means they were cut too close to the bone and the bone may fall out during the cooking process. Look for the meat to have a light pink pale color, with even marbling across the ribs. Avoid ribs that are “enhanced” (check the label), meaning they have an added solution of 10-15 percent of its weight. You don’t want to pay for water! The ideal weight of a slab of ribs is approximately 2- 2 ½ pounds and will contain 12 to 13 ribs. You will need a cutting board large enough to handle the ribs, a sharp knife, and a kitchen butter knife. 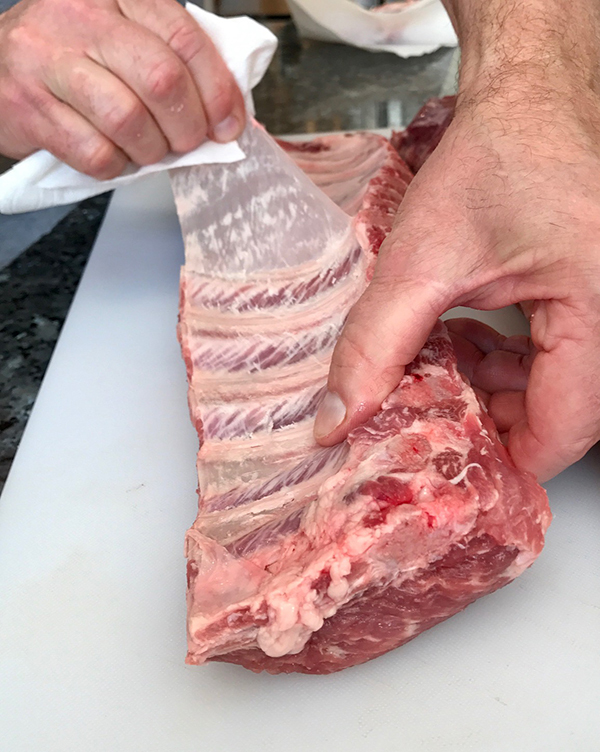 Open your package of ribs, pat them dry with a paper towel, and lay them out on a cutting board meat side up. Inspect your ribs; with a sharp knife trim off any dangling meat, excess fat, loose rib bones on the ends, and any silver skin you might see. Turn the ribs over to remove the membrane covering the rib bones. It’s important to remove this membrane so your rub can get into the meat. Start by inserting the dull butter knife on top of a rib bone on the small end of the rack; push the knife upwards to loosen the membrane. With a paper towel grab the membrane and slowly pull it toward the opposite end of the rack. With any luck it should come off in one piece. If the membrane tears, repeat until all of it is off. Trim off any loose fat or membrane. 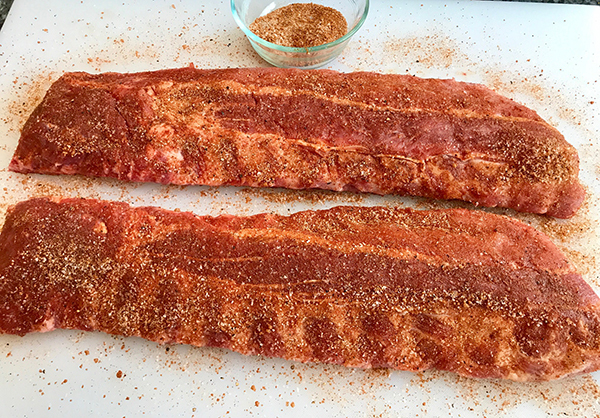 With the ribs already meat side down it’s time to apply your favorite rub. Apply a generous amount of rub across the bones and all edges of the rack. Turn the rack of ribs over and repeat on this side, making sure all surfaces are covered. 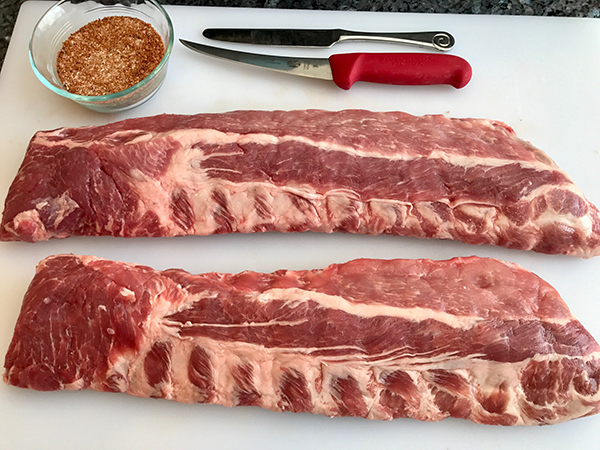 You have now successfully prepped your ribs for the grill or smoker! Check out the Weber blog for more great rib tips like Ribs 101, and recipes like Classic Baby Back Ribs and Best on the Block Baby Back Ribs from Weber's Greatest Hits.